This is one of my favorite vegetable recipe. I got this recipe from What's Cooking and I tried it last December when my hubby's friend visited us and had dinner at home. This is one way of enjoying eggs anytime of the day. Below are the engredients of this recipe. 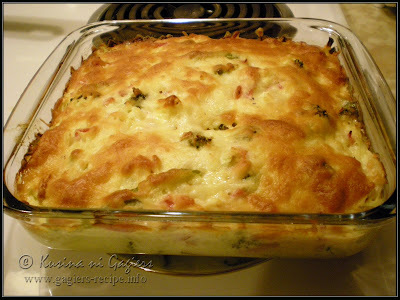 Combine eggs, dressing and milk in greased 2 qt baking dish. Add hash browns, ham and vegetables; mix until well blended. Bake 35 to 45 mins or until centre is set. Hi, cool blog about cookies. My wife likes it. Great. Sounds yummy. I want this in my tummy!